Srinagar: The army on Monday said that 18 militants have been killed in last last 21 days in separate encounters across Jammu and Kashmir. Corps Commander of Srinagar-based Chinar Corps, KJS Dhillon said that out of the 18, 14 were recruits of proscribed militant outfit Jasih-e-Muhammad ad six out of those 14 were main commanders. He said that Jaish’s 2nd commander Mudasir Khan, who was killed in a gunfight last night in Pinglish village of Tral in south Kashmir’s Pulwama was conspirator in highway convoy attack. 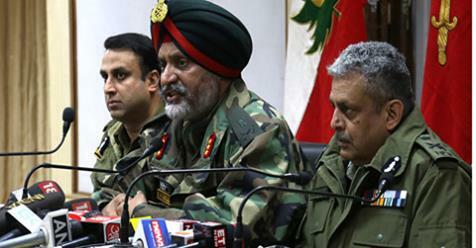 Gen Dhillon said that post Pulwama militant attack that left over 40 CRPF personnel dead, the main emphasis was on JeM so that they don’t carry out further such attacks. On Budgam crash, the GoC said that the investigations are going on about the probable causes of downing of the helicopter that left six IAF personnel and a civilian dead. The GoC was addressing a press conference along with Inspector General of Police Kashmir Range, SP Pani at Badami Bagh Cantonment. Pani said that the recruitment of militants has significantly dropped in last three months.